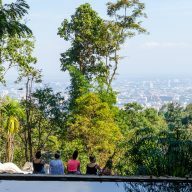 In November I started thinking that we’d run out of things to see around Chiang Mai. 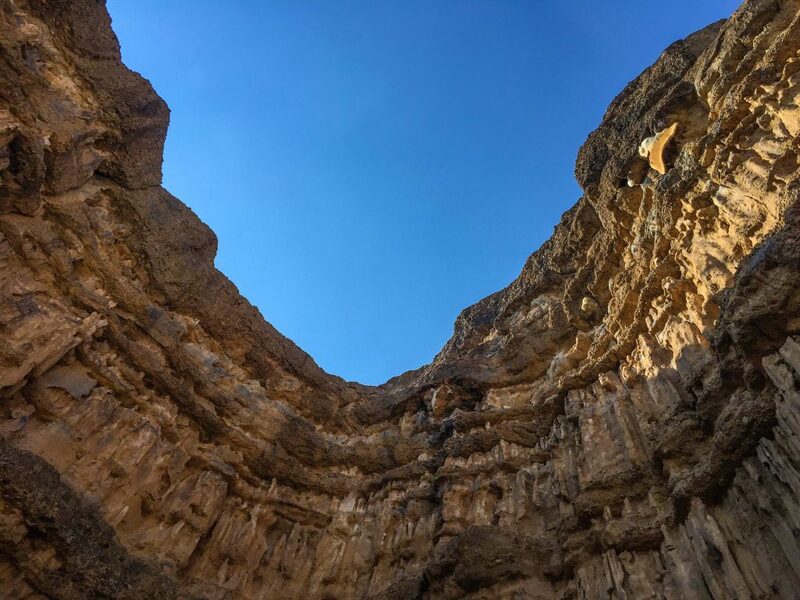 We had been to a couple of popular and less popular spots in the area and it seemed like we didn’t have more choices… Until I stumbled upon an article about the Pha Chor Canyon. It looked interesting enough, so Chris and I decided to hop on our bikes and make a road trip there on Boxing Day. What is Pha Chor Canyon? 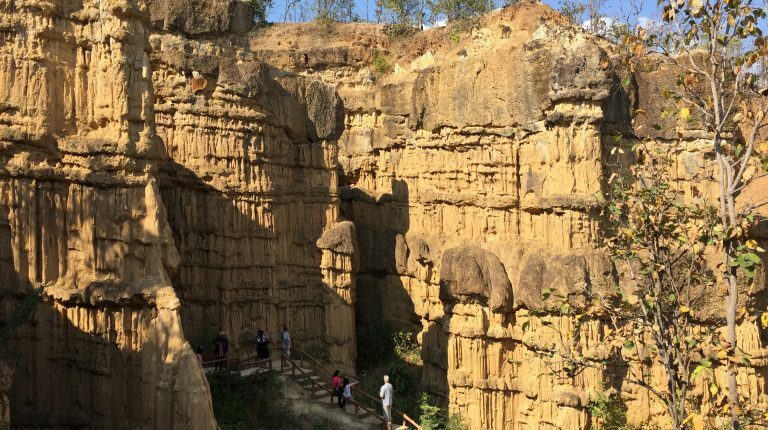 Pha Chor Canyon was created after Ping River changed its course many years ago. First the shift created a hill and after time passed the hill eroded and changed into cliffs and soil pillars. 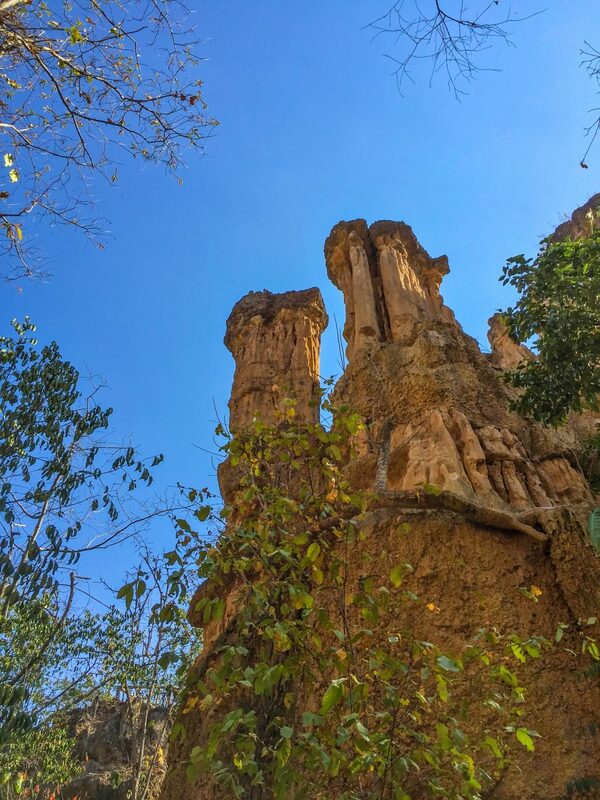 Today those pillars are 30 meters high and are one of the main attractions of the Mae Wang National Park. 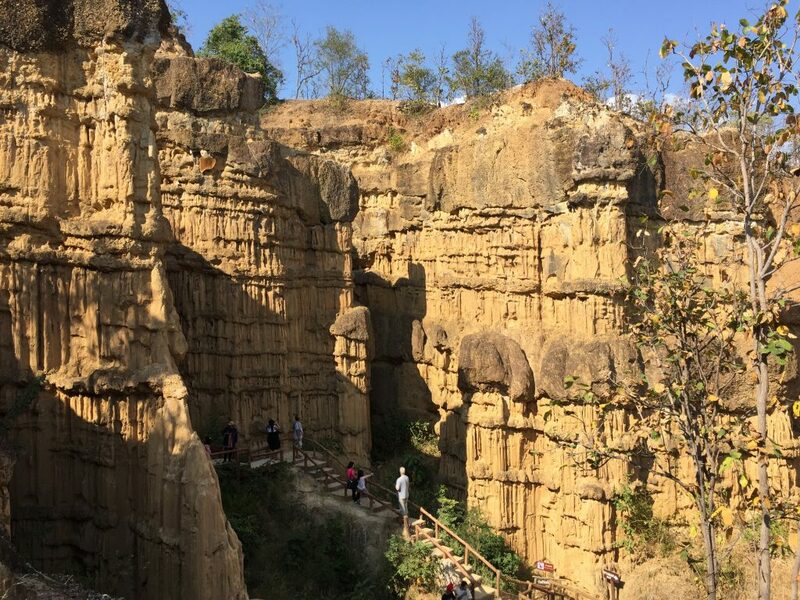 The canyon is located around 2 hours drive from Chiang Mai, very close to Doi Inthanon National Park. 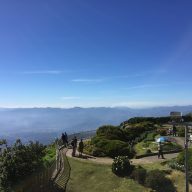 We realised that we could have gone there during our trip to Doi Inthanon, which we had done earlier in December. We drove exactly on the same road as before, route 1013, which is not a very interesting one. Only when we finally took a turn and drove off the motorway, the road started to be a bit more pleasant. We passed a few small villages, a couple of rice fields and after that it was just a straight, empty road. 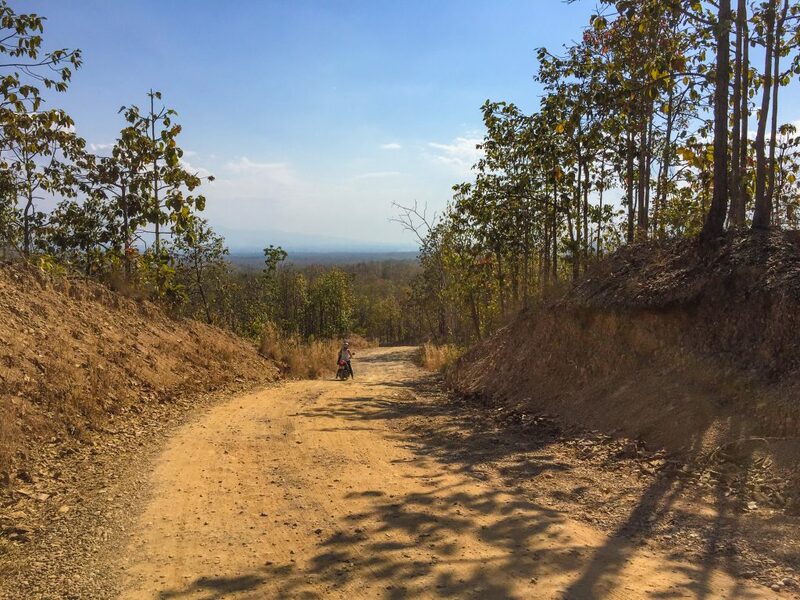 The journey was pleasant only up to the point when we crossed the Mae Wang National Park. From there it was just dirt, uneven ground and steep hills. In some places the road was too narrow to fit approaching vehicles and us and we had to stop at the side of the road to let them through. I must say, it was a bit scary. We parked our bikes at the entrance of the canyon. It was around 2 o’clock and the sun was burning. We hid for a bit at the only coffee shop in the area to catch our breath before we set off on a hike to the canyon. 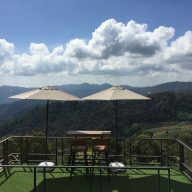 The café has really great views over the nearby area and we stayed there for a bit, enjoying the surroundings. I wasn’t particularly keen on walking down the million steps leading to the canyon. The sign on the top said the hike would take around 2-3 hours. In the scorching sun it seemed like the worst idea ever, but we came all this way and it would have been a waste if we didn’t go. Luckily, there weren’t that many stairs as we thought there would be. 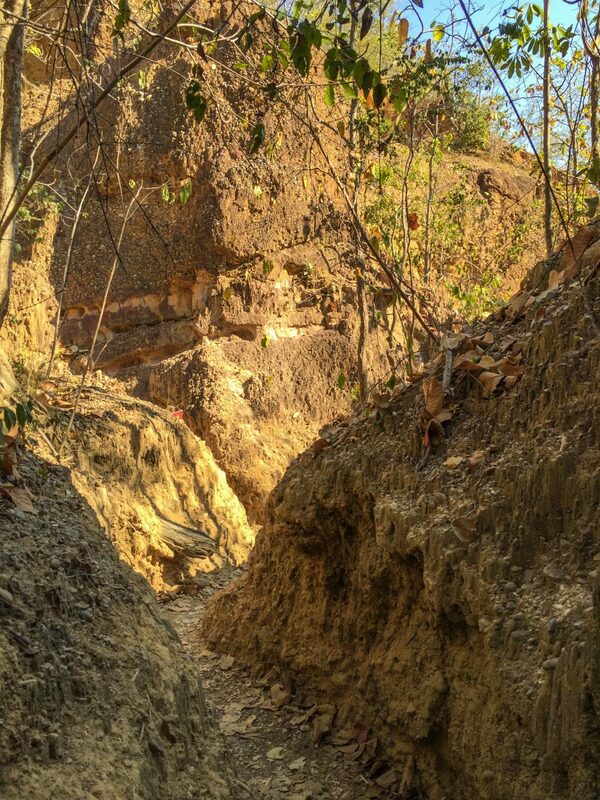 Once we got to the bottom the path led through narrow corridors sculpted in big, sandy rocks shadowed by tall trees. The hike didn’t take us longer than 20 minutes. When we finally got to the canyon and looked at it from the view point, it did look impressive. The yellow 30 meter sandstones looked like giants and made a perfect contrast to the blue skies we had on that day. We took more stairs down and admired the rocks from there for a bit. As it turned out the site was small, much smaller in size than we expected. Actually there were no other places to see, just a couple of square meters of tall rocks. 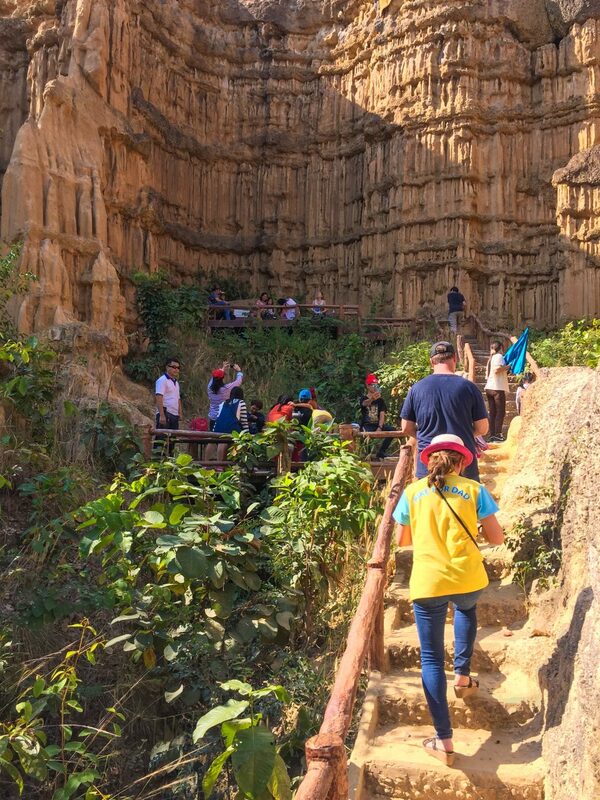 It was flooded with tourists, mostly Thais, who also chose that nice day to visit Pa Chor Canyon.It was hard to take a decent photo. I sat on a bench in a shade and refused to move. Chris was running around taking photos and thanks to him you can see now how the canyon looks like. He is never tired of taking pictures. We didn’t spend too much time there as there wasn’t that much to see. On our way back we chose a different route, leading to a day market in Doi Lo, which we didn’t find at the end. What we found was an even worse road than the one we had taken before. I was relieved when we finally reached a normal paved route. How to get to Pha Chor Canyon? You can either take the route 1013 and turn into road number 12039 and then number 10240. 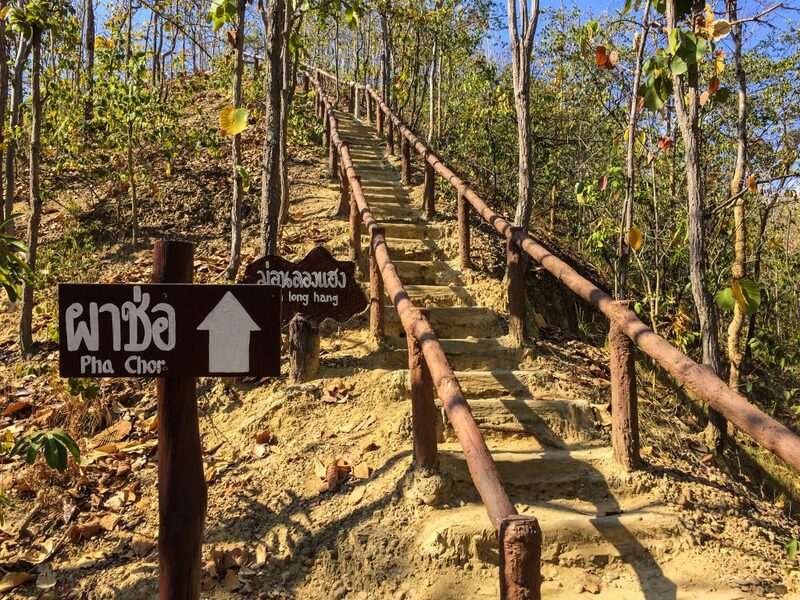 Pha Chor is located in Mae Wang National Park, Doi Lo district, Chiang Mai province. 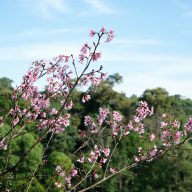 From Chiang Mai city, take highway no.108 (Chiang Mai – Hod) for about 21 kilometers, turn right to Mae Wang district along rural highway no.12039 and no.10240 (Mae Win – Bo Kaew) for about 36 kilometers arriving at Mae Wang National Park. Unfortunately, there are limited ways to get to Pha Chor Canyon. 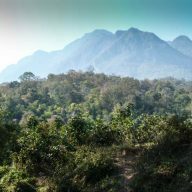 You can hire a taxi from one of the tourist offices in Chiang Mai, or ask if the office can incorporate the canyon to the trip to Doi Inthanon. The entrance fee for a foreigner is 100 Baht, plus a fee for a motorbike of 20 Baht. The Pha Chor Canyon can be visited at any time of the year, but it is best to go during the winter season (end of November – middle of February). Food and drinks: There aren’t that many places to eat and drink around the Pha Chor Canyon. The only coffee shop at the entrance of the park sells only coffee and other soft drinks and they don’t serve food. If you would like to eat, you can find some simple Thai bars in the nearby villages. We stopped at one at the main road and the food was pretty good. Gas: There are no gas stations around the canyon. It is best to get a full tank before you set off. In the villages, at the entrance to Mae Wang National Park, you might find someone who sells gas. The nearest gas station is at the main road. ATM: The guards at the gates to the canyon accept only cash and ATMs are not anywhere around. Good shoes. 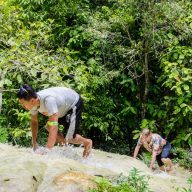 There’s no need of wearing trekking shoes, but anything else rather than sandals, or flip flops, will do. Arrive at the canyon either early in the morning, or around 2 pm, so it is not too hot. 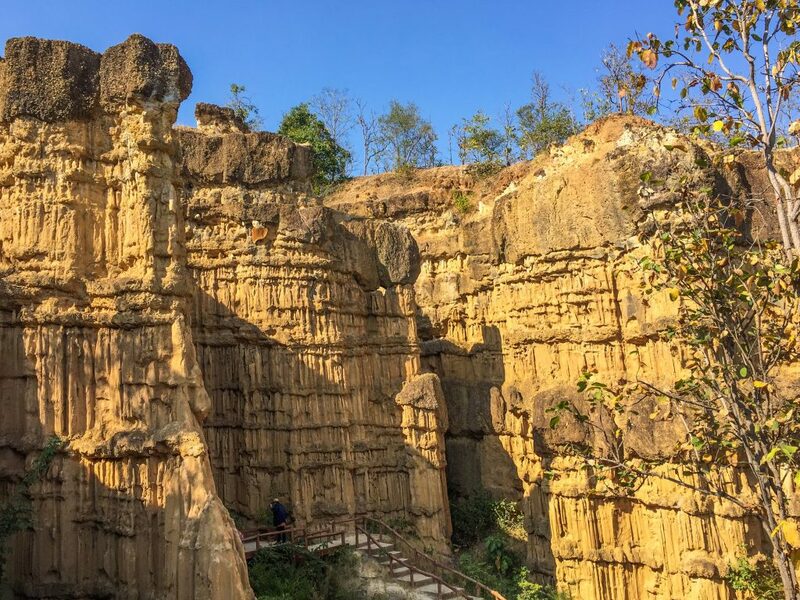 Visit Pha Chor Canyon on your way to or from Doi Inthanon, or combine it with other attractions in Mae Wang National Park. It is really not worth driving 2 hours just to see Pha Chor.